The site of the first Catholic seminary in the United States, where Father Demetrius Augustine Gallitzin studied for the priesthood, has been dedicated as Saint Mary’s Spiritual Center and Historic Site on Paca Street in Baltimore. Cardinal William Keeler, retired Archbishop of Baltimore officiated at the blessing of the newly - renovated facility consisting of the Chapel of the Presentation of the Blessed Virgin Mary and the Mother Seton House. Both are located on a one - and - a third acre property in downtown Baltimore that has been owned by the Sulpician Fathers for over 200 years, and was the original site of Saint Mary Seminary and University, now located in the city’s Roland Park section. The chapel, built in 1806 was the original seminary chapel. The three story Federal Style Mother Seton House served in 1808 and 1809 as the home and school of Saint Elizabeth Ann Seton. Saint Mary Seminary was established on Paca Street in 1791, and Father Gallitzin graduated from the seminary in 1795. Saint Mary’s was the first institution of higher learning in Maryland to receive a state charter. For some years, Father Gallitzin was a member of the Society of Saint Sulpice (Sulpicians), the priests who sponsored and staffed the seminary. 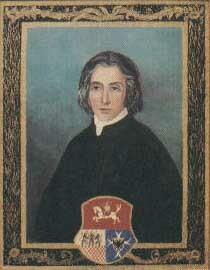 Architect for the chapel, the first Neo - Gothic church in the United States was French - born Maximilian Godefroy. He probably also designed the Mother Seton House, and was the architect for Baltimore’s Battle Monument and the State Capitol in Richmond VA. The chapel was the site of the foundation of two religious congregations of women: Saint Elizabeth Ann Seton’s Sisters of Charity, the first community of women religious to be founded in the United States, and the Oblate Sisters of Providence, the first religious community of African - American religious women in the country. The foundress of the Sisters, Servants of Immaculate Heart of Mary, Theresa Maxis Duchemin, also received her early religious formation at the Saint Mary site. Elizabeth Ann Seton was canonized on September 14, 1975. In addition to Father Gallitzin, others associated with Saint Mary’s now being considered for beatification include Bishop Simon Brute, a former faculty member of the institution; Father Michael McGivney, founder of the Knights of Columbus; Father Thomas Price, co - founder of the Catholic Foreign Mission Society of America (Maryknoll) and Mother Mary Lange, foundress of the Oblate Sisters of Providence. Also located on the property, and housing the Spiritual Center, is a former convent, built in 1896 for the Sisters of Providence who worked at the seminary. At the Spiritual Center, a Sulpician priest coordinates a program of spiritual direction for clergy, religious and laypersons, and also provides occasional workshops and days of recollection open to all. The Paca Street site is open to the public on a regular basis, and guided tours are provided for pilgrims and tourists interested in learning about and being inspired by the history of the site, particularly about the life of Saint Elizabeth Ann Seton. Programs and liturgies are also provided for groups with special connections to the site, such as visiting seminarians, priests, religious and parish groups. For more information about visiting the Saint Mary’s Spiritual Center and Historic Site, visit the facility’s website, www.stmaryspacastreet.org. Persons interested in preserving, maintaining and promoting the site may contribute to the “Rekindle The Spirit” capital campaign at The Campaign For Saint Mary’s Spiritual Center and Historic Site, 5408 Roland Avenue, Baltimore MD 21210 - 1988.